"Peshawar police chief Liaqat Ali told reporters the booby-trapped car appeared to have been parked at the side of the road and exploded as one consulate vehicle was near, forcing it to slam into an electricity pole." 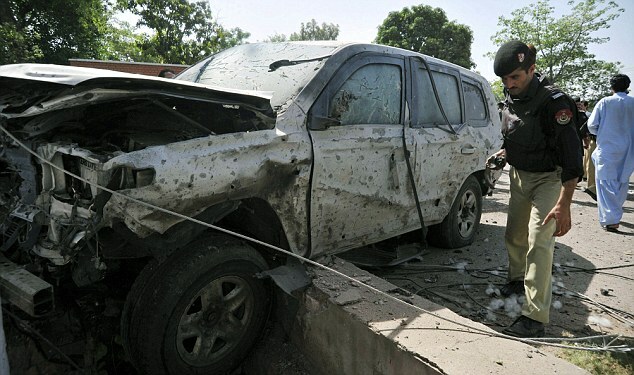 A Taliban group is claiming responsibility for the bombing but the modus operandi doesn't look like Taliban to me, and I don't think Taliban or al Qaeda in Pakistan have the kind of surveillance capabilities that would allow them to pinpoint when to detonate the booby-trapped car. An American diplomatic convoy was hit by a car bomb in Pakistan this morning in the latest attack in a surge of violence since Osama Bin Laden was killed. One local resident was killed and another 11 injured in the attack but no Americans were seriously wounded. Two American security guards were slightly hurt. The Pakistani Taliban claimed responsibility for detonating the 110-lb car bomb as the convoy from the US consulate passed in an area where many Western diplomats live. Peshawar has seen many attacks by Taliban militants seeking to topple the U.S.-backed Pakistani government and was home to bin Laden in the 1980s when Islamists were fighting the Soviet occupation of Afghanistan. Al Qaeda and its ally, the Pakistani Taliban, have vowed to avenge the killing of bin Laden by U.S. special forces, and, the group said it would target the Pakistani government and its Western allies. 'The diplomatic staff of all NATO countries are our targets,' said Ehsanullah Ehsan, a Taliban spokesman. 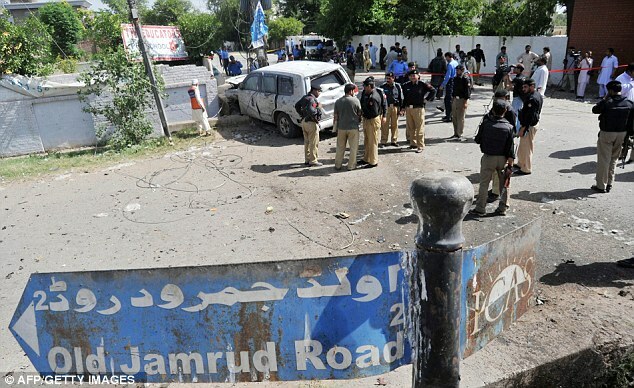 Peshawar police chief Liaqat Ali told reporters the booby-trapped car appeared to have been parked at the side of the road and exploded as one consulate vehicle was near, forcing it to slam into an electricity pole. Police superintendent Ijaz said two American security guards were slightly wounded, and were being treated at a U.S. medical facility. Pakistan has witnessed a jump in violence since bin Laden's death, including a twin suicide bombing last week that killed more than 80 people, most of them paramilitary recruits. [...] The passengers were driven away in the second vehicle. Alberto Rodriguez, spokesman for the US embassy in Islamabad, said the diplomats were travelling in armoured cars. “The attack was deliberately targeted against consulate vehicles,” he said. “It was a bomb blast. We are still investigating.” The Pakistani Taliban swiftly claimed responsibility, in a telephone call to the AFP news agency, and threatened further attacks against Western targets. "Our first enemy is Pakistan, then the United States and after that, other NATO countries,” said spokesman Ehsanullah Ehsan. Police in the city said 11 people were hurt, including two foreigners who were slightly injured. "A man on a motorbike who was passing by was killed in the blast, which was caused by a car bomb,” said one intelligence official on the scene. The US maintains a small presence in Peshawar, despite a high security risk — heightened by America’s unilateral raid to kill the al-Qaeda leader. The city is home to thousands of Afghan refugees and serves as a cross-border smuggling hub for insurgents. On Wednesday, swarms of militants attacked a police checkpoint just outside the city. Two officers and 15 attackers died in a fire fight that lasted hours through the night. "The devils look the same, no matter the era"